I love having something sweet after dinner, but sometimes I don’t really feel like baking a whole big cake just to satisfy that sweet tooth. This recipe is super easy and great for entertaining. My dad makes an almond version of this cake which is fantastic as well. The mini cakes basically come out looking like cupcakes. I used my small food processor to make these. Its an easy clean up too. You can top this little delight with what ever your taste buds desire. I know summer is now behind us but I am still a sucker for raspberries they have become one of my favorite fruits. 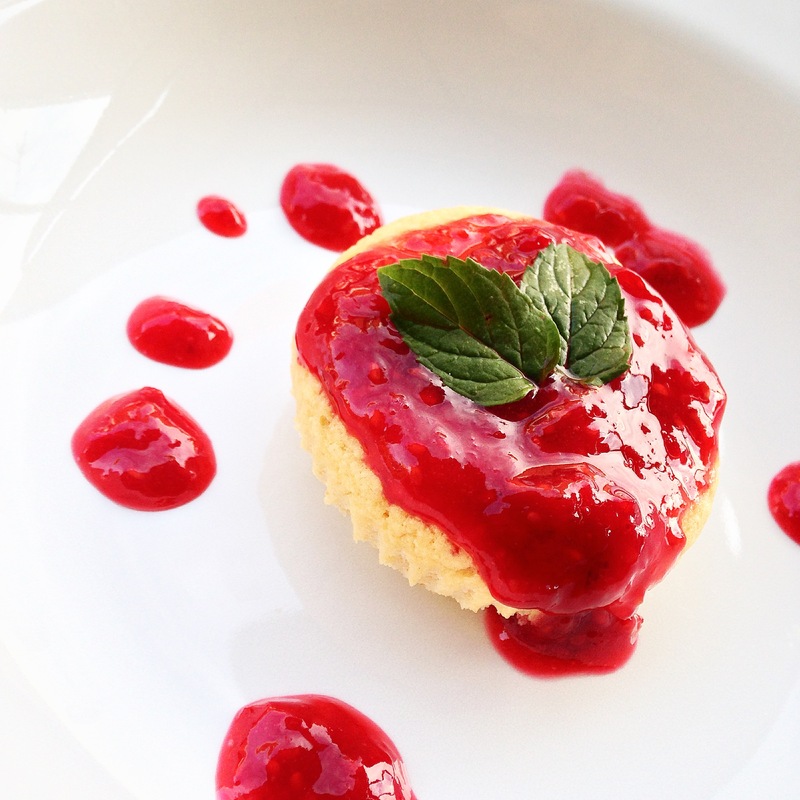 I made a raspberry sauce for this mini cake which is easy to prepare as well. You can also add a scoop of vanilla ice cream and enjoy with a glass of red wine or coffee. In a small to medium food processor add the ingredients. Mix for about 1 Minute until well incorporated. Take 4 baking cups that are lined with parchment paper and foil (picture provided in slide show of cups). Pour mixture into cups and into the oven. Bake for about 15 minutes until golden brown on top and toothpick comes out clean. Set aside to cool. Remove from paper and set on a plate. Turn mini cake upside down. This will give it more of a cake look. In a small saucepan on medium to low heat add ingredients. Stir occasionally and press down on raspberries. Takes about 8 to 10 minutes until you get a good sauce. If it dries out add a splash of water and stir. I love the seeds so I did not strain it. But feel free to do so. Drizzle sauce over mini cake. Next Post “Right Here” By Tony Luke Jr.